Purchasing your first home may seem like a daunting experience for someone who has never owned a home before. Similar to purchasing a car, there are an endless amount of red flags to look out for, pages upon pages of paperwork that need to be completed, and many things that you may not be experienced enough to pick up on while inspecting your potentially new home. For this reason, we’ve decided to highlight a few major items that you should consider inspecting before purchasing your next home. If you are considering purchasing a new home, and would like to know how much home you can afford, contact Mortgage Xpress today. We have over 30 years of experience in providing mortgage loans, financing, and lending to individuals in Birmingham and its surrounding areas. To learn about just a few of the things you should look for in your next home, continue reading below. Water heater replacements are a costly expense that can set you back anywhere from $800 to $3,000 depending on the make and model. For this reason, you should consider checking if the water heater in question has any discoloration or spots that appear to be rusting. Discoloration is easy to spot and is a sure indicator that the water heater is deteriorating. You should also check that the pilot light is a consistently steady flame, and is not flickering or going out. Flickering pilot lights usually mean that your pilot light is faulty and will need to be replaced. According to disastersafety.org, “69 percent of all water heater failures result from a slow leak or a sudden burst.” This is why it is vital to ensure that the water heater in question is working properly before deciding to purchase a preowned home. As a first-time buyer, you should inspect every element of a home that requires costly replacement fees. For example, you should check to see that the home’s roof is in good condition with no leaks or cracks. Average roof replacement costs can range from $6,000 to $9,000 which is a hefty expense when also paying off a mortgage. To no fault of their own, most first-time homebuyers don’t have the eye for spotting problematic appliances, roofing, plumbing, or electric wiring. If, for some reason, you feel that you aren’t entirely sure what to look for, you should consider hiring an inspector to look over your potentially new home with a fine tooth comb. 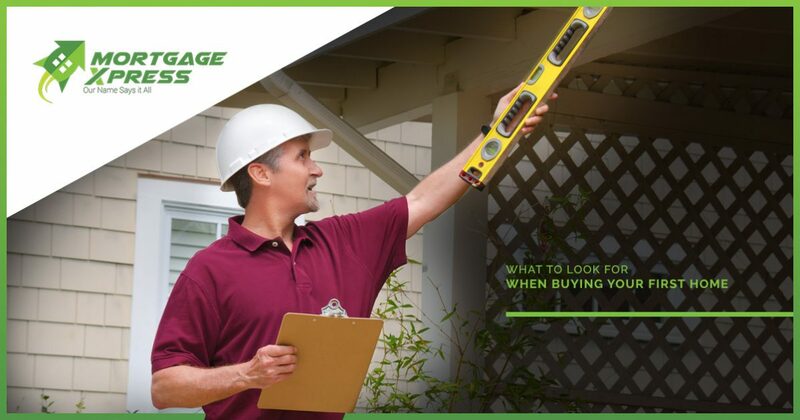 Inspectors are professionals who are hired to look at a wide variety of homes, so they will be able to easily spot any red flags that may present themselves. The items listed above are just a few of the many things to look for when buying your first home. If you have any questions or inquiries, or would like to learn more about applying for a mortgage loan, contact our experienced and knowledgeable staff at Mortgage Xpress!